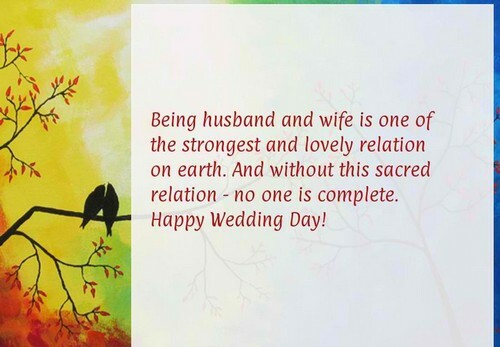 Wondering how to wish a newly married couple with some amazing quotes? No matter what great gift is wrapped for the wedding couple, a few personalized and loving words will make a lot of difference. 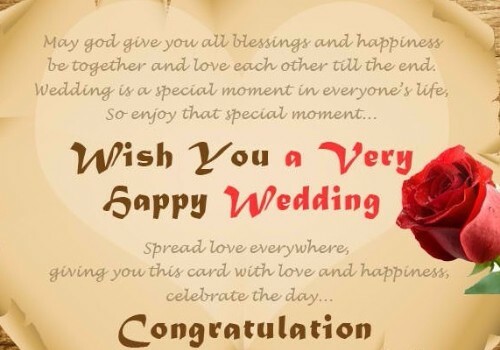 If you are lacking words to communicate your greetings, here are few best collections of wedding quotes and short wishes for newly wedded couples. Customize these as per your requirement by adding names and memorable events and share with the couple to see the joy in their eyes. Let this occasion mark the start of another journey. May the life ahead be a cheerful one with love, happiness, excitement, joy and peace. May this everlasting love be like that of a crown jewel which will tie all the bonds together. Hearty wishes to the loveliest couple. As we look upon the two hearts that has united, we pray for their unity all throughout this journey of love and forgiveness over time. Our warm wishes on this joyous day. Congratulations on this big day! We are honored to be a part of this special occasion and watch the blossoming love between our two special friends transcend to eternity. 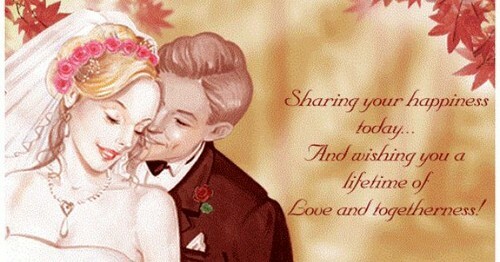 May your love and commitment for one another deepen and grow stronger with each passing day. Our warmest wishes to one of our very endearing and lovely couple. May the bond that you share unite your souls as one and bring out the best in one another. 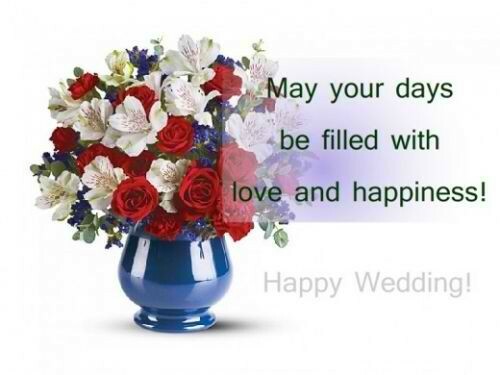 We are more than delighted on this special day of your wedding. 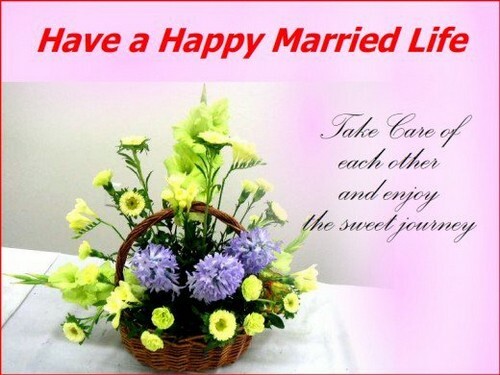 We together wish you a lifetime of happiness and togetherness with each passing year. Big congratulations on your special day. May this marriage be like that of a thousand candles shining bright like the stars on a clear night. Marriage between two people signifies the bond of their unification. May the happiness and love that you two share continue to be like that of the sands in the sea. We are immensely happy to be a part of your wedding. Let the years ahead bring you all the joy and happiness with unconditional love. On this day we give out the warmest wishes. May the trust that you two share grow with every second. We wish all the happiness and peace on your journey. Finally, the much awaited day has come. As you two are about to start a journey of togetherness, we wish that you love each other unconditionally until the end of time. My special wishes to the lovely couple. May your love bloom in your souls this day so that it can be a foundation on which greater monuments of love will be built. As you are all set to move into a new life by holding each other’s love in your heart and vows of passion, commitment, love and loyalty. We wish that the journey ahead be joyous as this day. Our heartiest wishes for the most adorable couple on your big day. When in a marriage, never forget that your better half gives you all the strength to succeed in life. Wishing the bride and groom happiness and peace, joy and laughter in the journey ahead. A beautiful marriage is when you keep falling in love with the same person again and again. Best wishes! May you two grow in this life with wealth and prosperity. Wishing the best ahead. We wish the loveliest couple a beautiful family and that you two grow old together in love. We hope you both have happiness and joy all this life with lots of memories to cherish. May this life of yours be content in each other’s company. We wish you both grow old together and stay as happy as always. We wish the bride and groom a beautiful journey ahead filled with love and passion for one another. 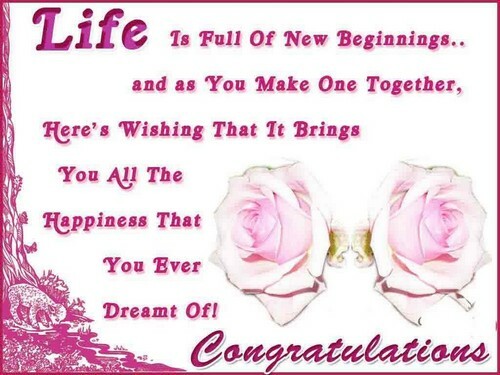 One of life’s most treasured gifts is to share the dream, that’s why we all wish you an amazing life ahead. We wish you both an adventurous life together. Stay happy! On this special day, I wish you two have beautiful days ahead with lots of memories to cherish from them. We wish the best for you, but try not to overpower each other. There is nothing that can grow alone in the shade. Wishing our lovely couple a great life, with bountiful number of special memories throughout. A marriage can bring joy and happiness; we wish you both a lifetime of happiness and peace with each passing day. Reflect on the love that you feel for each other today and keep loving and growing together as a family. It’s simple, you just have to keep one another happy and show that you love them for what they are. We wish you both understand each other and stay happy always. Let all the luck and happiness stay with you two forever-Congratulations on your big day! Congratulations! May you do your best to build your love and trust upon each other with each passing minute. We wish that you express your love to each other every day and do not forget them during the challenges that life throws at you. It is great to see you both together so happy and in love on this occasion. We wish you a beautiful life ahead. We wish you both all the happiness and harmony in your life from this day on. Let all your days ahead be as glorious as this day. Congratulations. Grow up as much as you want but don’t let your innocence of love fade away. I can’t yet decide if you two were a match made above or if you both make it look heavenly. Congratulations on your wedding. The wedding will last only for a day but the remembrances will last all through a life time. Best wishes! 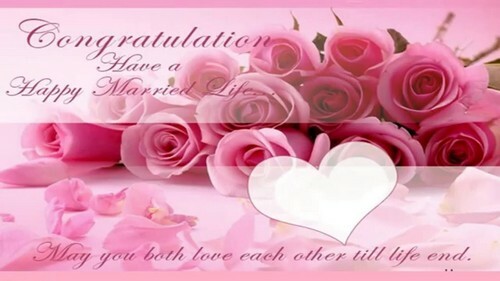 Congratulations on this special day. For this is the sweetest thing that has ever happened to the both of you. Keep smiling! If you take a moment and peel away all the celebration that has taken place, you will realize that this wedding was actually the reunion of love and destiny. Now that you have become a soul, as a man and wife there will be dreams which are to be fulfilled, goals to be achieved and hearts to be cherished. Congratulations on getting hitched. Treat your marriage like that of a wine tasting event and try to value every note, touch, simplicity and season of your wedding in order to make it loving, passionate and enthralling. Congratulations. Celebrations will always come and go, however love will always grow. Take care of it while you still have it. Best wishes to you two! I am posting your pictures on Facebook and Twitter because in that way your wedding will spread happiness- the way you two do in life. Congratulations for the most adorable couple ever. In spite of where this life will take you, don’t ever forget how it all began and how endearingly you love one another. Congratulations. I did not believe in fairy story until this day of you two. Seeing you both together makes me happy. Best wishes. I do in a marriage, completes a beautiful poem and marks the beginning of a lifetime of togetherness. Congratulations. By looking at you both, I bet that every bachelor and spinster envies the perfect pair ever. Heartiest wishes for the perfect couple. I must say that your wedding pictures must be saved and preserved for I guess that not a couple will be as perfect as you two. Happy married life! Today when you both say I do, we say cheers for the happy couple and wish you both a very long and happy life ahead filled with adventures. 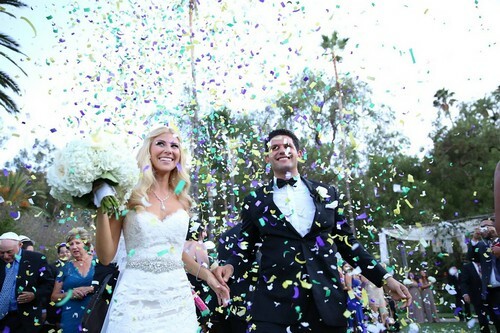 The beautiful wedding ceremony of a gorgeous couple like you both is a proof that love beyond doubt exist. Best wishes! On this occasion, we are more than happy to celebrate your love and marking of your journey together. Congratulations! As you stand there and handcuff the thief that stole your soul and heart with the wedding ring. The hunt for your better half has come to the end. Congrats! We are immensely happy on your wedding day because we have seen you go from saying ‘boo’ to I do. Congratulations girl. I would say that your wedding is as beautiful as perfect it could be. Congratulations on your big day! We see you two happy and we know how perfect you are for each other. We wish to see you both happy throughout your journey of love. Best wishes! I think you should fix a huge symbol at your house that reads the most happiest and loving couple on earth. We wish you two the best in everything. Let’s assume that your marriage is like that of a rubber band where, it gets expanded, pulled, warped, tugged and twisted like that of the different phases in your life. But it’s going to hold you close at the end. Congratulations! Your wedding is one of the most beautiful ceremonies I’ve ever seen. I wish that your married life is as beautiful as this day and I hope that you enjoy every day of your journey ahead by sharing your love with one another. Happy married life! You two as soul mates are charming, as life partners are enchanting and as lovers are divine. We love you both. Congratulations! There is much more meaning to those colors on your black suit with your wife’s perfect white gown that are opposite nevertheless complementing. This shows how the dissimilarity in your characters is in-sync with each other. Best wishes!